This is a beautiful fish that is rarely seen. Notice the orange 'tang' on the caudal peduncle just in front of the tailfin. Also the fluorescent blue fringe on the edges of the fins. Isn't the Sohal Tang or Red Sea Clown Tang magnificent! The Sohal Tang or Red Sea Clown Tang is from the Red Sea and the Western Indian ocean. Although fish from the Red Sea are generally more expensive, they are always net caught and are handled with more care, which gives them a much better survival rate. These fish are somewhat difficult to keep, but you should be able to obtain a very healthy specimen which increases the chances of this fish surviving in the aquarium. Video of a very upset Sohal Tang in the wild! This short clip demonstrates why the Sohal Tang, Acanthurus sohal, is referred to as aggressive! While they will adapt to other fish that have been in the tank after they arrive, adding new tangs or wrasses is unwise, since they will attack them. They are very territorial as this video shows! No this fish is "warning" the divers to stay away, but it does appear to be dancing! These tangs grow to 16" and need a 250 gallon tank or larger. Like other tangs the Sohal Tang is high energy and needs to be fed several times a day and should have algae sheets to nibble on in between. Sohal Tang in dealer's tang. This video shows the wisdom of the store because this tang is alone! 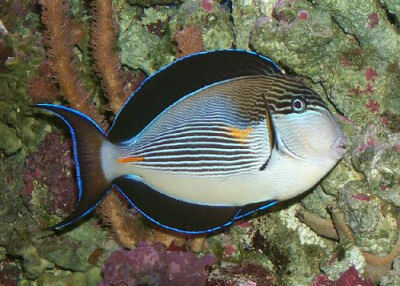 A Sohal Tang, Acanthurus sohal, needs to be the only tang in the tank and will attack any fish, including wrasses that are added after they have settled in. One video showed a 3" Sohal Tang attacking a newly added 8" Sohal Tang! While they are younger and smaller, they pose less of a threat, but as they grow, most aquarists have to decide between their Sohal Tang and the other tangs in the tank. They are very aggressive once acclimated and have been known to charge after a hand that is in their space! Most of this aggression is from males, however females can be quite nasty once they grow up! Provide your 16" tang with 250 gallons or more of space! Habitat: Natural geographic location: Sohal Tang or Red Sea Clown Tang are found in the Western Indian Ocean: Red Sea to the Persian Gulf. Maintenance difficulty: The Sohal Tang or Red Sea Clown Tang is easy to moderately difficult to keep. Social Behaviors: Can get territorial especially if another tang is added to a tank with an already established tang. Temperature: No special requirements. Normal temperatures for marine is fish between 75 and 79 degrees. Length/Diameter of fish: Sohal Tang or Red Sea Clown Tang adults can grow to 40 cm (16 inches). Minimum Tank Length/Size: A minimum 100 gallon aquarium is recommended. Availability: The Sohol Tang is occasionally available at retailers but is rather expensive. They are priced about $100.00 USD and up. My sohal tang is about 6-7". I put it in the tank. It was fine for about a month then I added a king angel, french angel, blueface angel and rock beauty angel. The sohal tang went nuts and started attacking all the angels and my other tangs that were in the tank with him previously. So I had to take him out and put it in my QT. I have just added a sohal to my tank, 75 gal. It houses an ashfur angel, purple tang and a blonde tank. They all get along perfect, they're all around 3-4 inches in size. I have them in a well set up reef tank, the four fish together, just incredable. I plan to get a golden butterfly to wrap it up, wish me luck. One of the most beautiful fish I have ever owned; however it is a headache. Extremely agreesive. Everything I add, it gets bullied until death. He will attacks any new addition. I am looking to add a Flame Angel, a Bi Color Angel and a Blue Tang, and I am just afraid that they are going to end dead as well as the others. Any ideas? I am willing to sell it or trade it. Large about 6 inches long.